Decorative items featuring Britain’s Union Jack flag motif are all the rage around the globe. Earlier this week Canvas Color Kitchen featured a counter top to ceiling Union Jack flag motif, but not in the usual color scheme. The original is red, white and blue, as shown inside the heart of this striking British memorabilia cushion from Jan Constantine. 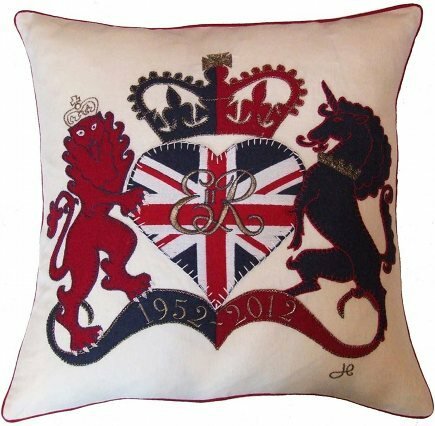 The cream linen pillow was designed for Queen Elizabeth’s Diamond Jubilee and features hand embroidered appliqué wool work. 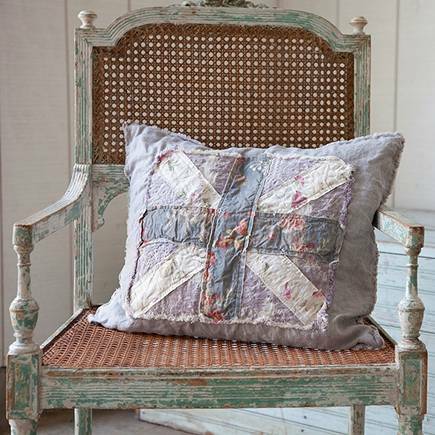 Softer colors and floral fabrics are used in this limited edition Prairie pillow by Rachel Ashwell Shabby Chic Couture. I love the raw edges and hope to snap one up when the perfect colors for my home come along. 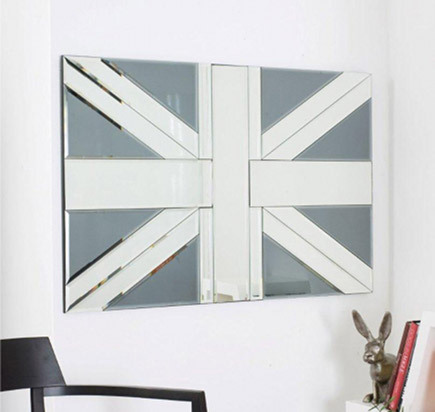 Grey-shaded segments form part of the design in this Union Jack mirror wall art — funky, functional and fun. Don’t miss the custom Union Jack sofa in Antique to Chic Upholstery, and Shabby Chic fans won’t want to miss An Interview with Rachel Ashwell. I’ve seen these all over blog-land, and while I’ve seen some I like, I’ve not jumped on this bandwagon yet. Holly Mathis has featured some cool ones on her blog. They are very topical presently and it’s nice to see the variations. I expect many bloggers post about them. They have their highs and lows, but are always around. I’d love something funky (like the sofa in Antique 2 Chic). Maybe next life.